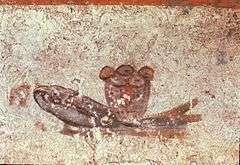 Early third century depiction of eucharistic bread and fish, Catacomb of San Callisto, Rome. The Bread of Life Discourse is a portion of the teaching of Jesus which appears in the Gospel of John 6:22-59 and was delivered in the synagogue at Capernaum. Uniquely, in the one prayer given to posterity by Jesus, the Lord's Prayer, the word epiousios—which does not exist elsewhere in Classical Greek literature—has been linguistically parsed to mean "super-substantial," and most literally interpreted as a reference to the Bread of Life, the Eucharist. The title "Bread of Life" (Greek: ἄρτος τῆς ζωῆς, artos tēs zōēs) given to Jesus is based on this Biblical passage which is set in the Gospel of John shortly after the feeding the multitude episode (in which Jesus feeds a crowd of 5000 people with five loaves of bread and two fish), after which He walks on the water to the western side of Sea of Galilee and the crowd follow by boat in search of Him. John's Gospel does not include an account of the blessing of the bread during the Last Supper as in the synoptic gospels e.g. Luke 22:19. Nonetheless, this discourse has often been interpreted as communicating teachings regarding the Eucharist that have been very influential in the Christian tradition. Meredith J. C. Warren has challenged the Eucharistic interpretation of this passage. Warren argues that it reflects ancient Mediterranean traditions of sacrificial meals that identify a hero with a divinity. In the Christological context, the use of the Bread of Life title is similar to the Light of the World title in John 8:12 where Jesus states: "I am the light of the world: he who follows me shall not walk in darkness, but shall have the light of life." These assertions build on the Christological theme of John 5:26 where Jesus claims to possess life Just as the Father does and provide it to those who follow him. ↑ "Catechism of the Catholic Church". ↑ "oremus Bible Browser : John 6:24-35".